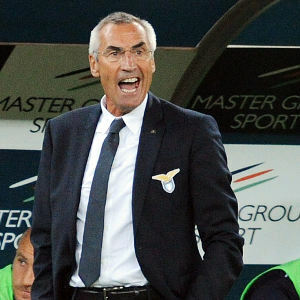 Finally, at long last, Lazio coach Edy Reja said the right things moments before his side's crunch encounter with Romanian club Vaslui in the Europa League: "We will play a competitive team in Romania." Speculation suggests that Miroslav Klose will start from the outset as will Djibril Cisse and Hernanes. Oh wait, did you forget? Yes, the Europa League is happening right now. This week, the Europa League theoretically had the European limelight to itself since the Champions League, its richer, better looking, more popular cousin, was off until a reappearance next week. And yet, earlier this week, there was scarcely any mention in the Italian media of the two matches that Udinese and Lazio had to play. Most of the focus, perhaps somewhat justifiably, was on Napoli's game against Juventus on Tuesday. For the future of Italian football, the Europa League is solemnly significant. As I have written previously, it is not only that Italy have dropped behind the Bundesliga that is the concern, but also that France and Portugal are making inroads on the fourth spot in the UEFA coefficient ranking, a spot currently held by an increasingly nervous looking Serie A. Well, at least, you would like to think the league is nervous, and not fatally complacent. "When it comes to the Europa League, our clubs rest players," said the typical harbinger of doom and gloom, Milan vice-president Adriano Galliani, earlier this season. "This is why we're behind Cyprus this year." Lest the calcio lover is anxious about a power shift from Rome, Milan, and Turin to Nicosia, Limassol, and Larnaka, we need to put things into a more ruddy context. Udinese's 0-0 draw with Rennes last night means they only have to avoid defeat against Celtic at home on December 15th to make it into the next round. And if Lazio defeat Vaslui in Romania today, then the Biancoceleste will also qualify. However, while these games do not seem monumentally difficult, it is the ability for Italian clubs to make them difficult that is unnerving. Udinese should have come home with the three points yesterday, but Francesco Guidolin rested players like Antonio Di Natale and Giampiero Pinzi. Notwithstanding that, only the upright denied what seemed a certain goal for Antonio Floro Flores. Guidolin could argue that it was not only he who rested players yesterday. Harry Redknapp did too, and Tottenham duly lost at home to PAOK Saloniki. However, the Premier League isn't fighting for its face, its identity, and its spot at the summit of the coefficient rankings, a spot that looks assured for years to come. Yet, when Guidolin was asked whether he would stop rotating players if Udinese made it out of their group, he remained non-committal, responding with a "we will see." As thrilling as they can be, victories like the one Napoli claimed over Manchester City in the Champions League will not solely decide where Italian football sits in a few years. There is a fight for prominence going on, away from the glare and riches of the Champions League, and it counts. That fight is in the Europa League--in the back-alley and by the dockside. Serie A better be ready for it. When Galliani said "When it comes to the Europa League, our clubs rest players; This is why we're behind Cyprus this year." I don't think that he should blame other Italian clubs as Milan is equally if not more guilty. Of course, the fact that EL are treated as the same as CL in term of coefficients is ridiculous, considering how vastly different they are treated financially. I don't think though UEFA has any intention to change that. Maybe it is all part of Platini's "big plan" to eliminate the gap between the big countries and small countries. On a last note, EPL need not worry about the pending exit of Tottenham from EL. City, United and Chelsea are soon joining this prestigious tournament to boost their chance of winning this glorious trophy. LOL.